So much for our BBC. Useless stats. Since when did he ever played striker role with already Benzema and CR ? A better one would be assist count. it's not useless at all, it shows his impact in numbers against europe best. It's mediocre. 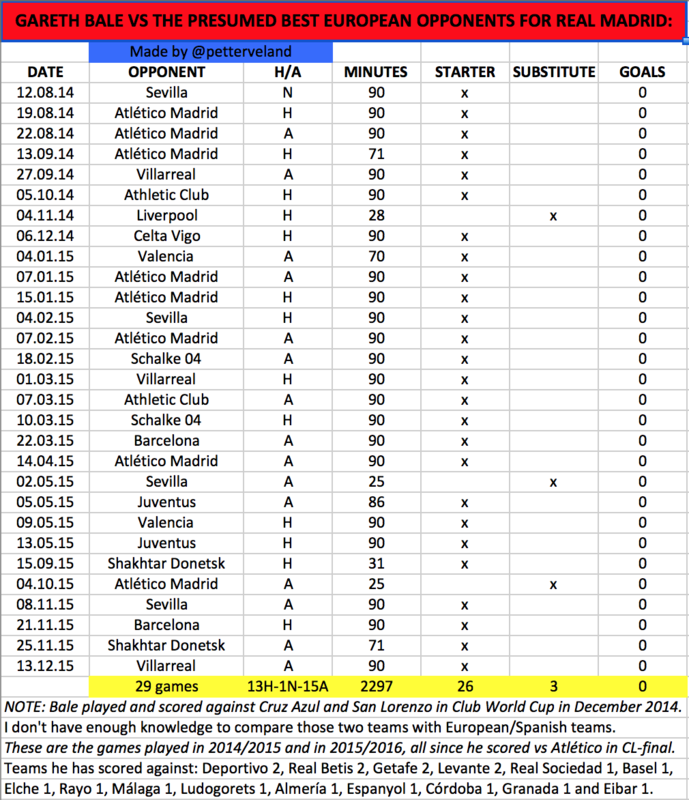 By comparison look at how MSN contributes against big teams, they all score, they all play with one another. Bale was the secondary scorer.... only this season has he become more a creator and taken a back seat to Benz as a scorer. So you can take the bottom 4 games on that chart (all of this season's games)... and he's still shite lol. It is useless. We plays 442 not 433 and there are two fixed strikers and Bale is usually the one who is crossing. Like I said why not bring assist stats? Pretty sure James will have similar goal stats, even worse I think. I want bale out but I'm not stupid to use stats with out context. James was never the #2 scoring option who was allowed to dive into the box at will. And who is our #2 in two striker formation that has Benzema and Ronaldo as strikers? Are we going to pretend that Benzema became our second best top scorer for last 3 years by being #3rd? We plays 442 and since CR and Benzema are always there for the cross nobody goes there to over crowd just like today. Bale usually puts in crosses. Blame him for that, bring the assist stats and let's talk. But these statistics taken out of thin air are useless. Benz was dezoning all the time under Carlo while Ronaldo and Bale would attack the box around him. Didn't happen 100% of the time... but a good 75%. It was pretty clear that, although Benz was the number 9, he was playing the 10 or 9.5 (whatever you want to call it). His role was primarily to help the ball move, link up and open space with his runs.... and then score when he got the chance. But the plays were primarily designed for Ronaldo and Bale. The number of shots prove it anyhow. Go take a look at the totals of Bale compared to Benz last season. Bale took 160 shots while Benz took 97. Pretty clear. Bale almost always takes shots from outside the box. Using flawled statistics to prove another flawed statistics. This is getting hilarious. I can't understand why we are blaming individual players when it is so clearly how these players are being positioned is the reason they are set up to fail. we are playing a 4-2-4 : is that not a problem for you people? if bale is creating chances and assisting I'm fine with him not scoring much. He should have more goals though. there is a difference between rotating players and not knowing your favored line-up. rafa's clearly the latter, you don't see any consistency with the changes. its like he wakes up in the morning and decides, you start and play this position. people say we play 4 2 4. but i don't know what that front 4 is, we can't classify them as wingers, nor midfielders, just attackers and a cf. it seems to me we play 4 2 1 1 1 1 or 4 3 1 1 1. We're absurdly badly coached. Youth teams are better organized than this. No gap control and no triangulation. The ball carrier needs an option forward and, if that's covered, a fallback laterally or behind. The players without the ball move to open areas... they don't stay static and allow themselves to be easily covered. Wtf is this we're running. Players are too far apart AND they're not making any movements that would surprise the opposition.... we're completely predictable. It's easy to defend AND to attack. Well today's game has done it for me. i don't know who to be upset the most at. Perez - it is his signing of so called galacticos and refusal to have a sporting director that is the root of all our problems. And he has rigged the election process so much that he will be around yet for years to come. Benitez - I agree with everything negative that has been said about him. When I look at tactics today, with basically an improved lineup over Carlo from last year (in that Casemiro in for Kross), I saw huge gaps between lines, basically 5 guys on defense, 4 on offense, and three of them STANDING in the same space with no movement, and only Modric in the middle trying to find a target. Pathetic - no other way to describe it. BBC - how can anything happen when they all want to occupy the same space. Time to get rid of all three of the, but we all know the only hope to leave is Benz because of his upcoming criminal conviction. James - tell me again why this guy deserves to start over Isco. He was useless out there today. Danilo - why he gets the nod over Dani is just beyond me. I would even take Arbeloa over him at this point. this has gotten to me so much that as of today, I am switching my allegiance to Real Oviedo, who today moved into 3rd in Adelante and we are hoping a return to la liga after an absense of 16 years. It is not easy for me to make this switch to my home club, after 25 years of being a Real Madrid Socio, but I don't see anything positive of this current setup. i think carvajal's still injured, that would explain danilo's "presence"
I would be ok with Danilo being meh defensively if he could cross like all Brazilian fullbacks can... but he crosses like Arbeloa ffs. AND he's not that technically gifted. I'm convinced his birth certificate is forged. There's no way he's from Brazil. I think he should be moved to CB.... his makeup is far more suited for that position and he has the size. @sportsczy wrote: I would be ok with Danilo being meh defensively if he could cross like all Brazilian fullbacks can... but he crosses like Arbeloa ffs. AND he's not that technically gifted. His fitness and agility for a fullback is absolutely shocking, which you need for that position. Add to the fact like you said, his technique is very poor and you have a mediocre fullback. I think his speed is OK, but he looks like a fish out of the water when he plays. Dunno if he lost his hamstrings or something in the preseason. Danilo tactically looks clueless. He kind of just runs around like a chicken with its head cut off. When Marcelo finally matures and gives us best career performance we get an idiot to play as RB. Poor carvajal. Dude got isolated last season due to bale's laziness and 2v1'd every time and now it looks like perez's new toy will start no matter what, whether dani is injured or not..
Are you really going to blame James for Rafa's utter tactical cluelessness? Look at us, everybody is playing bad, from Benzema to Navas. Every.single.one. So let's throw everybody under the bus just because our tactical genius doesn't know how to position his players. Nobody played this bad under Carlo. Rafa lost the dressing room. I'm sure he's doing his best, but he's simply not good enough for a team this big.